The youngest members of the Barbadian society have not been left out of the Christmas celebrations being hosted by The Royal Commonwealth Society. Christmas in the Square is back, and today prior to the lighting of the trees, Loop visited the scene and saw some teachers and students putting the final touches of their trees. A. Dacosta Edwards Primary, which is an amalgamation of six St. Andrew schools, was assigned the island of Malta. "We asked the children to go home and do a little bit of research and come back and tell us what they found out about the country. We basically used what they said. So there is ‘Carnival’ hence why we have the masks. It has a booming fishing industry so we have the fishing boats. They’re Christian like us so that’s all the angels and they are mostly catholic, so they focused a lot of the crib and the nativity scene, so we did some mangers. We showed the flag and then all the balls and stuff like stars we put Malta on them. They also created some people,” explained Class 1 teacher, Maria Hoyte. In addition to wire and card, the students re-used CDs and popsicle sticks. Not sure what each student will take away, but speaking in terms of her Class 1 group, she said that they compared Malta with Barbados and learnt the similarities, instead of focusing on the differences. Maria Holder Trust Nursery at Gall Hill was assigned two countries. On each tree they added some facts about the countries along with stars and bells to keep the trees festive. Laughing, she said she's just praying that the children remember their trees, even if they don’t remember the facts. Across the Chamberlain Bridge in Heroes Square are the countries which have been decorated to represent the parishes of Barbados. St. Mark’s Primary was given St. Andrew and they used sand to indicate the beaches and sandpit. They created pottery and incorporated windmill decorations to showcase the Morgan Lewis Windmill. They have the rock at Barclays Park, and the St. Andrew Parish Church, as well as facts about the parish and the Saint, all around their tree which is located across from the gates of the Parliament buildings. 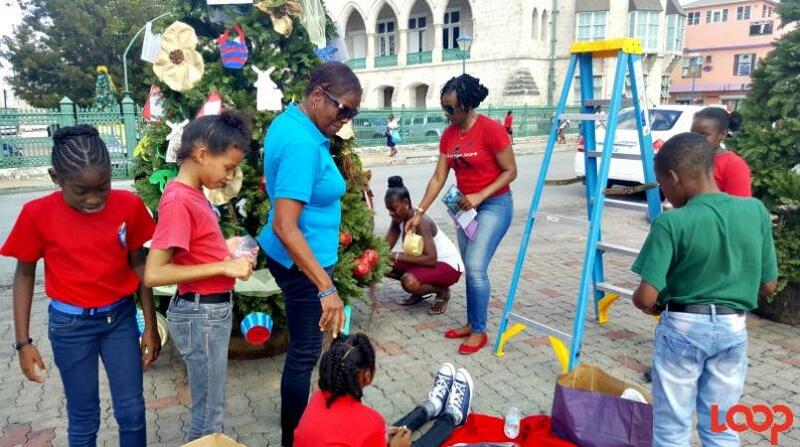 Principal Stephanie Bennett was assisting students and teachers with the decorations, and she pointed out the green monkey decorations as well, saying that they even attached ‘the beard’ of the Bearded Fig Tree, which grows in that parish. At the top of the tree was the cross of St. Andrew. The Principal also shared that added to the tree are fat porks which many students only saw on sale in Bridgetown but never actually knew that they grow on vines in St. Andrew. Hillaby Turner’s Hall decorated their tree to depict Harrison’s Cave because they have St. Thomas. They also have cows and fruits on their tree. The dolls on the tree represent some of the old people who came to town on Saturday mornings to sell their produce in baskets. That said, baskets are also on the tree. Teacher Ruth Critchlow said that the dolls also represent the craft that you can get from vendors in St. Thomas. Parents and guardians are being asked by the teachers to take their children and wards to Bridgetown during the Christmas break to take photos in Independence Square and Heroes Square.